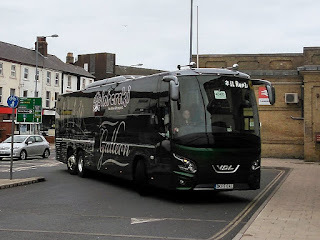 Late this afternoon I was passing Great Yarmouth's Beach Coach Station and observed nine vehicles on site. This time it's Wright Solar bodied Scania L94UB 65673 SN51UYG which is now back on the road. A couple of entries of interest appear in today's Notices and Proceedings Report published by the East of England Traffic Commissioner. 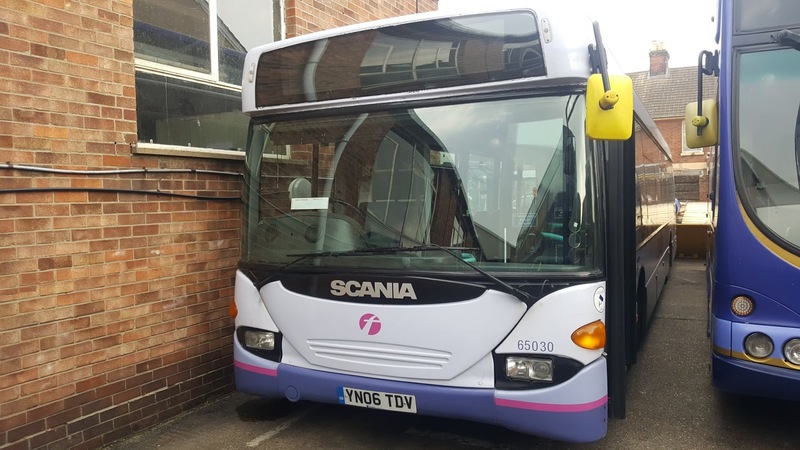 Konectbus is to extend the route and amend the timetable of its service 5B between Stalham and St Stephens Street in Norwich City Centre from 23rd April 2019. D R Fosdike of Halesworth has been given approval to increase the number of vehicles operating at its Fairfield Road premises to two. Most of you will know that the PSV Circle publishes G Lists which contain details of Current Fleets of Bus and Coach Operators. The publications are usually provided in an A5 booklet for each county. The current edition for Norfolk, G654, was last published in July 2014 so its due for another update. 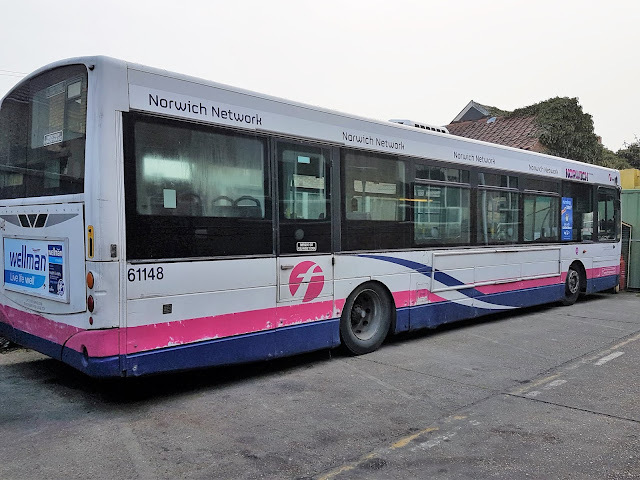 As already reported, First Great Yarmouth Volvo B7 66334 MV02VBZ has been resurrected to active duty once more following its second withdrawal during late February. 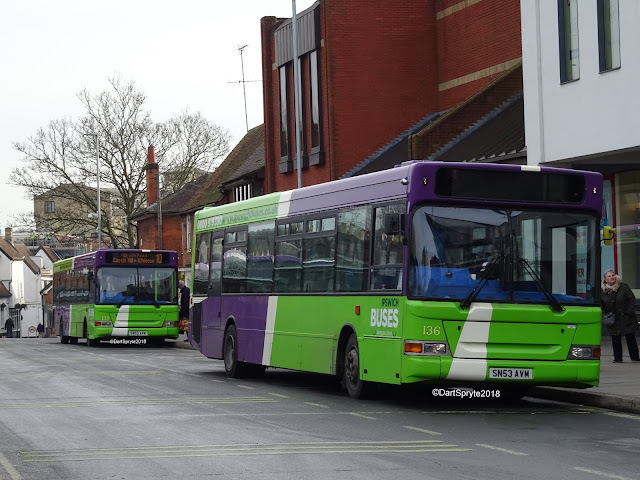 It was seen in Gorleston High Street this afternoon operating the on the 9 route between Market Gates and the James Paget Hospital. It was Alexander (Belfast) bodied Volvo Olympian S916ANH which was running on trade plates. It was last with Bennetts of Kilwinning in Scotland and was still there in January of this year. 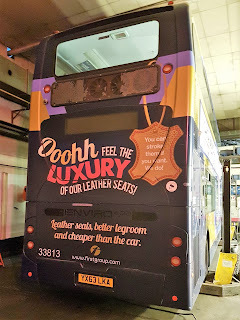 The Olympian was purchased new by Midland Red (South) in December 1998 and subsequently became Stagecoach Warwickshire 16616. Jamie headed back to Great Yarmouth via Haddiscoe on the A143 and caught up with it again on Beccles Road in the town. This implied that it had done a circular route to Great Yarmouth and was returning to its place of origin, perhaps via the A146 to the Norwich area. A quick run around the usual haunts earlier this morning to see what was about, passing Shearings Mercedes Benz Tourismo 134 BU18YSL on its homeward journey. 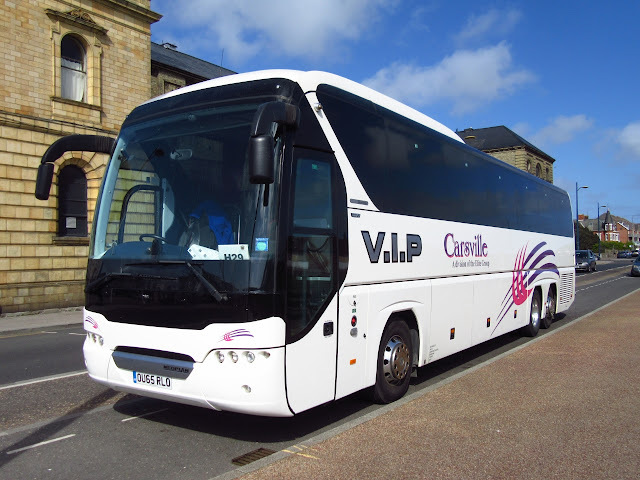 Outside the Carlton Hotel on the seafront was similar 131 BU18YSH ready to load passengers and baggage. Further north, in front of the Nelson Hotel, was Olympia Travel's Plaxton Elite bodied Volvo B9R G15GOL. 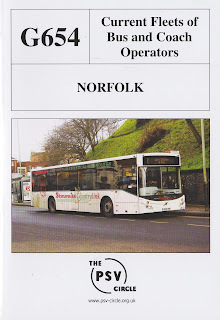 It was new to the operator as YN12BNO in April 2012. The latest news from First Great Yarmouth is that Excel liveried 37275 LK58EDJ is back on the road after receiving a new differential and was noted in use at Market Gates earlier this morning on the X1 service to Lowestoft. Also in the workshops is open topper 32905 W905VLN, being prepared for the summer season, together with 30954 YJ51RDO with gearbox work underway. 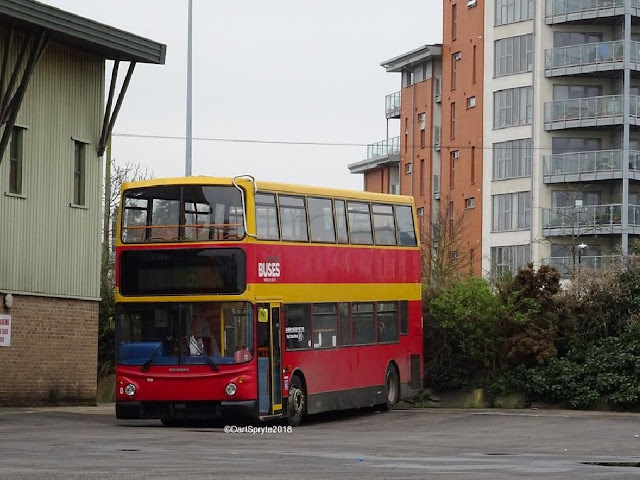 ALX400 bodied Volvo B7TLs 32210 LT52WTR and 32061 W221XBD were undergoing MOTs. 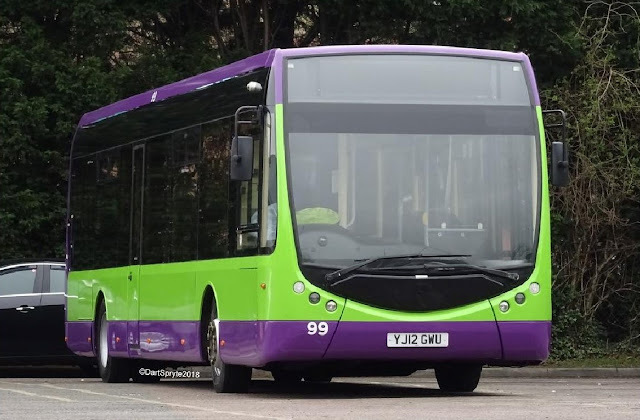 It has been some time since we have looked at developments at Ipswich Buses and the following has been provided by Jordan Watson. The new arrivals will mean the disposal of the now elderly Dennis Darts with the exception of 85 PJ53OLE which which will be converted to a driver trainer. This means the end of the road for Myllenium Darts 84, 87 and 88 (PJ03OLC/H/K) along with ex Lothian Super Pointer Darts 134-136 (SN53AVG/K/M) and Scania CN94UB OmniCity's 70-5 (YN56NVB-G). They have been advertised online as being available for sale along with Leyland Atlantean Open Topper 9 MRT9P, which is locally rumoured to have a buyer already! A few relevant entries appear in today's Notices and Proceedings Report published by the East of England Traffic Commissioner. 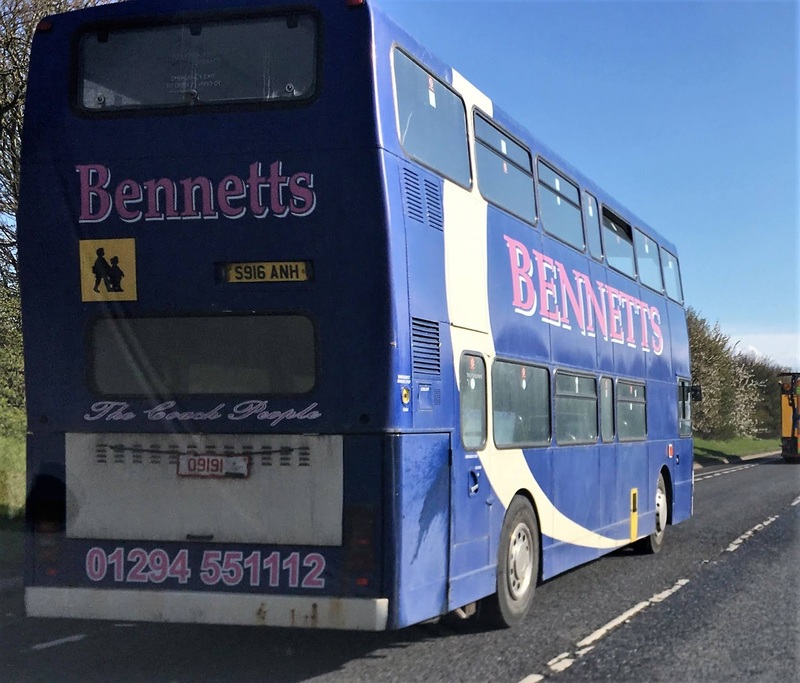 Sanders Coaches has registered a new 23 service between Church Crossroads, Honingcroft and Riverside Retail Park in Norwich from 7th April 2019. It will run via Litcham, Mileham, Brisley, East Bilney, North Elmham and Billingford on Wednesdays only. The operator will also amend the route and timetable of two routes from the same date. They are the 25 between Fakenham and Dereham Cherry Tree plus the 24 between Fakenham and St Stephens Street in Norwich. Jeffrey John Buckle has been granted approval to use premises at 23A Ormesby Road, Caister as an operating centre for five vehicles. 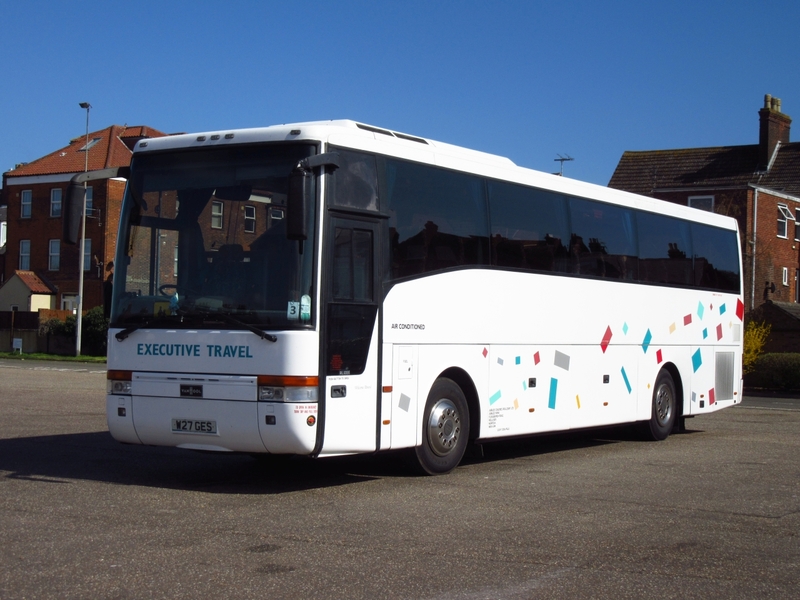 The property was previously used by Reynolds Coaches. 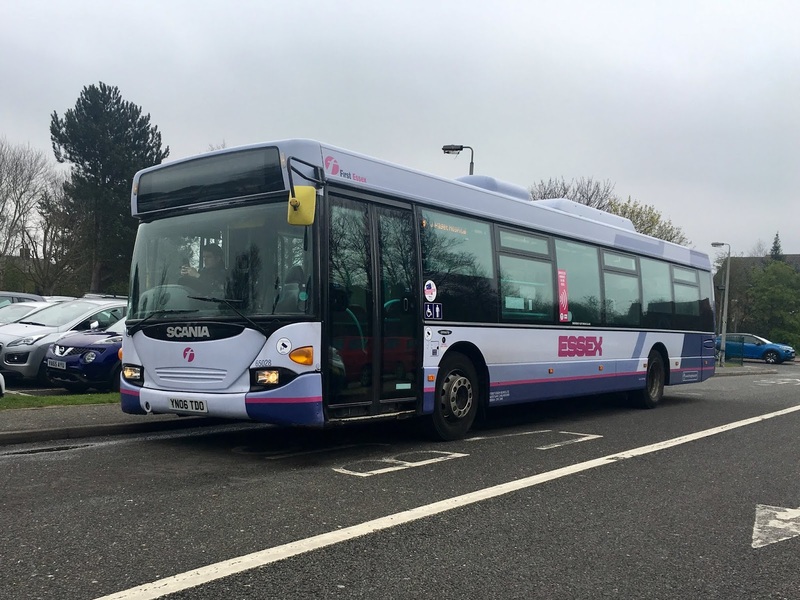 At least one of the two former First Essex Scania OmniCity single deckers was out in service this afternoon. I got a photo of 65028 YN06TDO which had just arrived at the James Pages Hospital on the 8 from Caister Second Avenue. It was awaiting time for the 14:30 return journey. Yesterday saw the ninth and last day of local rail replacements with the expectation of rail services returning today as normal; although an early points failure at Brundall put paid to that! Returning to Sunday, local operators provided the bulk of the replacements. Smiths Coaches Volvo FJ53KZK was on standby at Great Yarmouth whilst Freestones Coaches Scania YN07LFY arrived from Norwich in megabus.com livery. 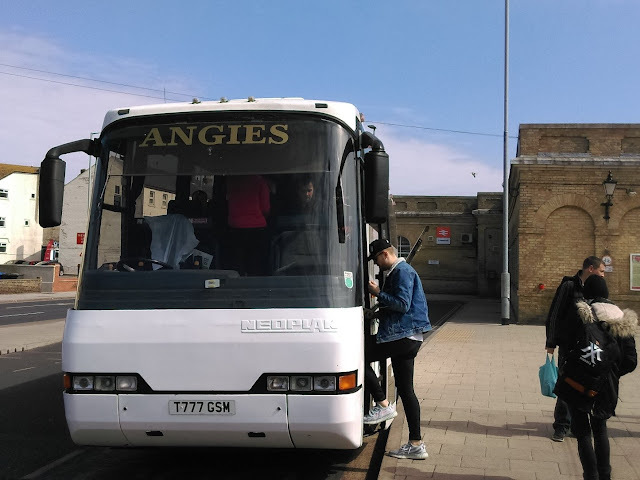 At Lowestoft Simon Bartram reports the use of Wrights Coaches Kassbohrer Setra K400PTS whilst Angies Coaches Volvo B10M H182DVM was on standby. 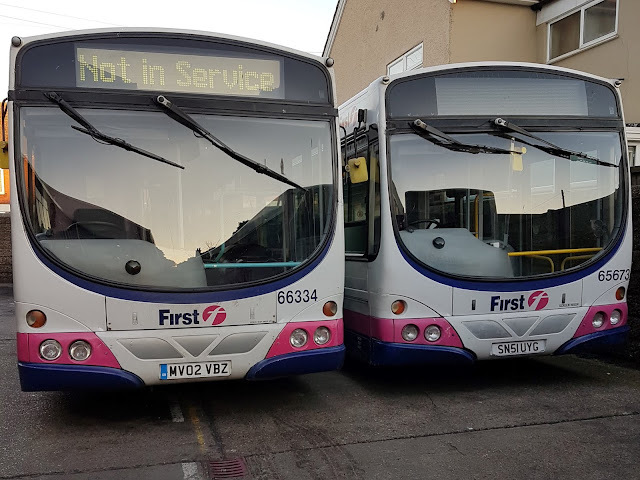 The latest from First is the transfer of Alexander ALX400 bodied Volvo B7TLs 30948 YJ51RRV and 30961 YJ51RDV from Caister Road to First Lowestoft. The deckers were moved yesterday with the former only having arrived in Great Yarmouth in late January. This could mean that the recently moved Scanias could be on the road soon. 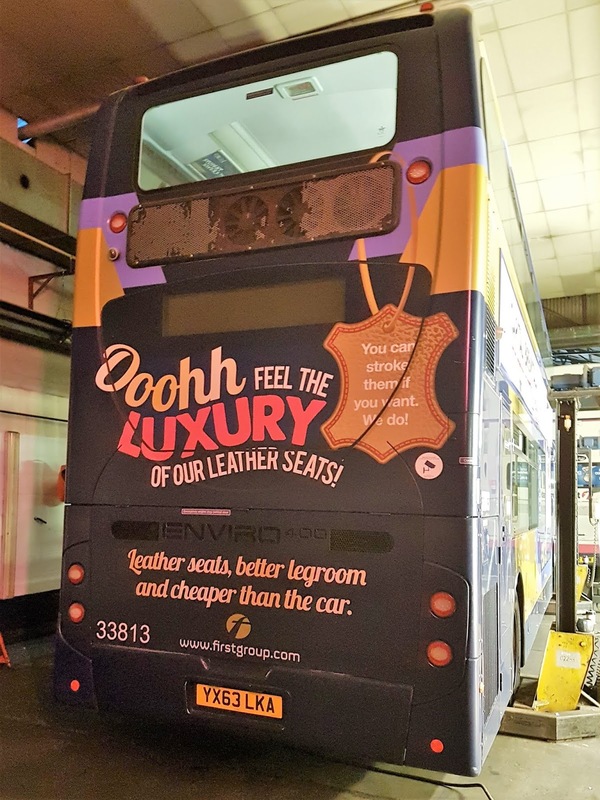 Talking of saloons Volvo B7 66334 MV02VBZ has been resurrected for service once more. In the workshops B7TL 30954 YJ51 RDO is still awaiting a gearbox whilst Excel liveried 37275 LK58EDJ requires a new differential. 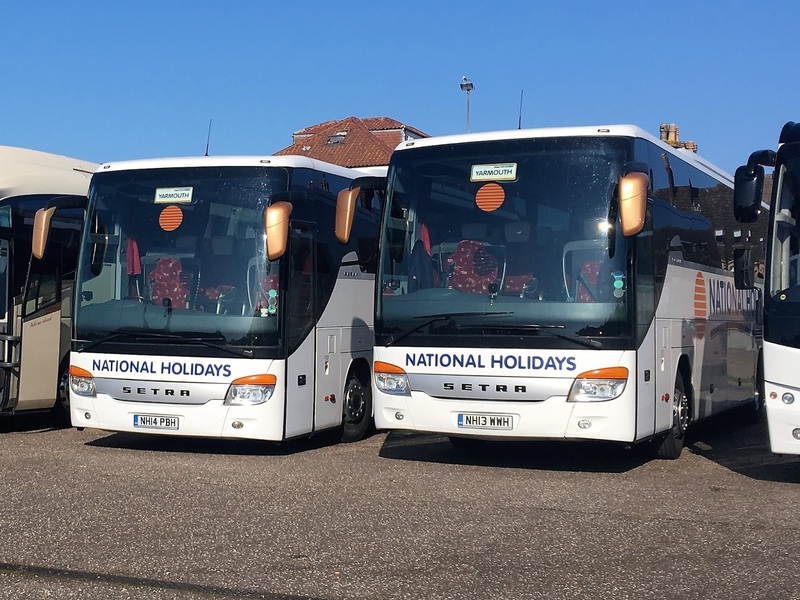 Captured some Sunday Coaches whilst out and about today in the Sunshine. First up is OU65RLO a Neoplan Tourliner belonging to Carsville Coaches of Stockport. Next up is Shearings MB Tourismo 841 BJ16KXR, which according to the entrance door is called 'Wendy'. Finally noted at the Coach Park was former Spratts Van Hool W27GES now under the ownership of Jubilee Coaches of Rollesby. 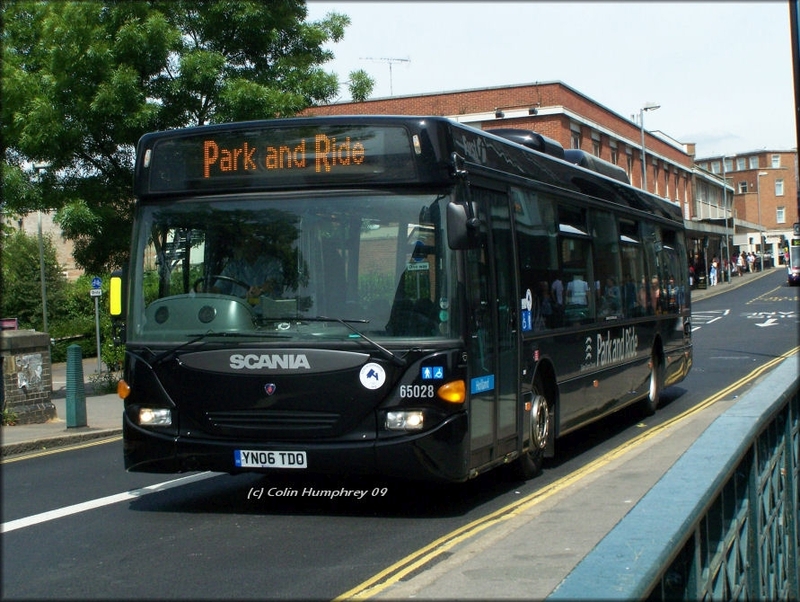 Friday saw the appearance of two Scania Omnicity Single Decks at Caister Road from First Essex. 65028 YN06TDO & 65030 YN06TDV. It appears they are just passing! 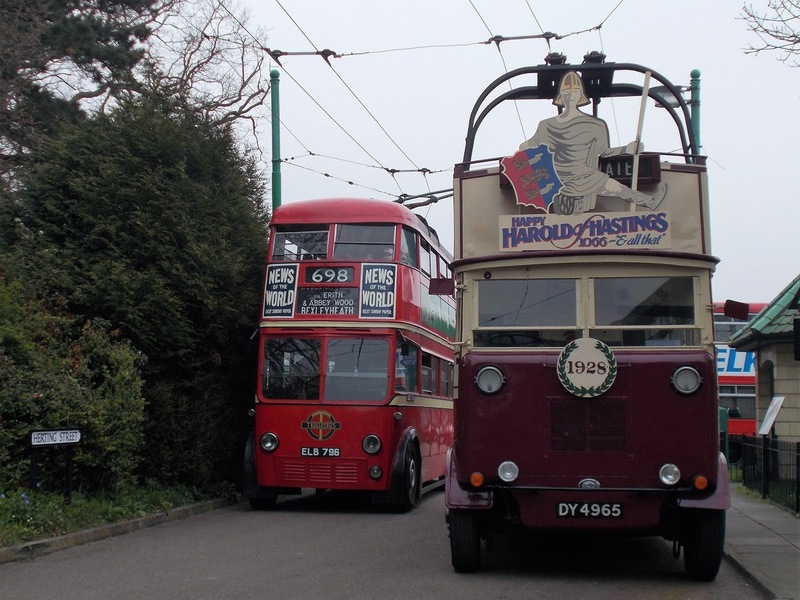 Both are destined for further use with First Potteries after being withdrawn from the Essex fleet recently. They were allocated to Clacton Depot prior to its closure, they moved briefly to Colchester before they were marked for transfer. We are told they may see use at Yarmouth for a week or two as more vehicles are required for Bernard Matthews Contract work due to changes in the factory shift patterns. Both were new to First Essex for use on Chelmsford Park & Ride services in 2006 as you can see in the photo above. Thanks to First for the info and to Tom Green and Colin Humphrey for the photos. Whilst I had a lazy day and just couldn't be bothered to get out and see what was happening at Great Yarmouth Station today, Simon Bartram was on the ball again at Oulton Broad North Station with photos of some of the rail replacement workings. His first sighting was of BMC 220 type YK55AUA, which was originally delivered new to First West Yorkshire in December 2005. 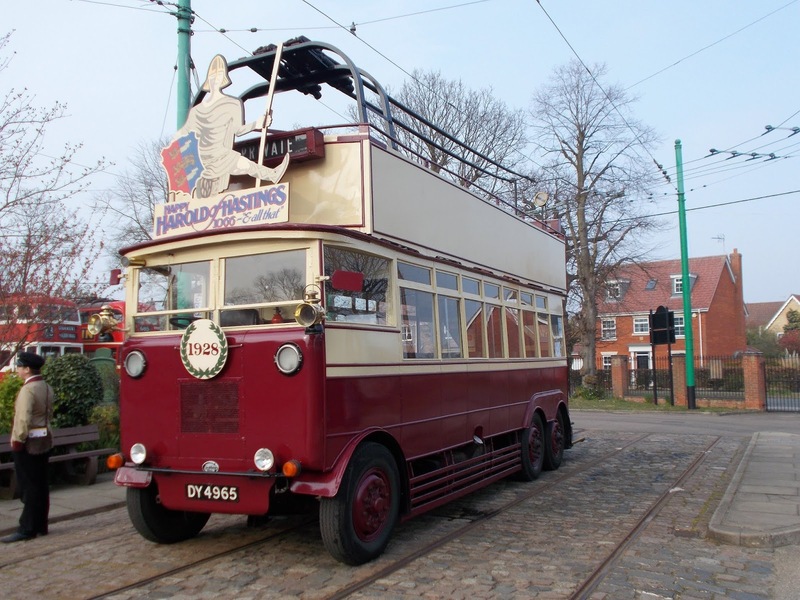 It has recently been acquired by Aylmerton based AFSC t/a Marett’s Chariots and carries fleet number 509. The bus is seen passing Oulton Broad North signal box whilst employed on the 08:56 Lowestoft to Norwich service. Seen travelling in the opposite direction, and thought to be on the 08:55 from Norwich, was M&M Staffing's Neoplan Tourliner tri-axle MM68BUS. It was new to the Essex operator in December 2018 and was also exhibited at the November Bus & Coach Show. 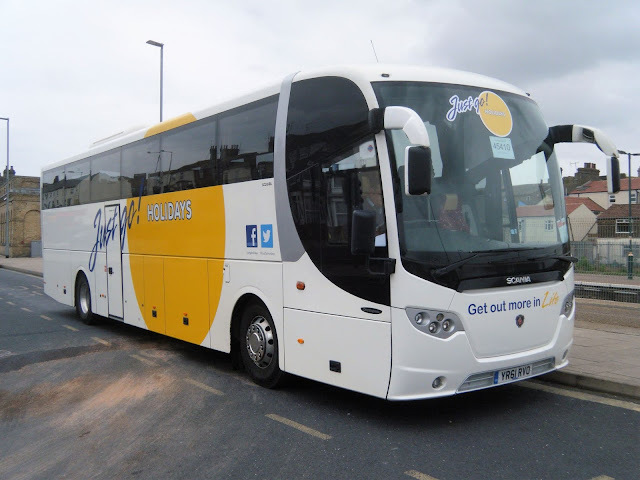 Ambassador Travel's Sunsundegui Sideral bodied Volvo B12M 251 KIG8458 was also being used on rail replacement and departed on the 09:57 Lowestoft service to Norwich. 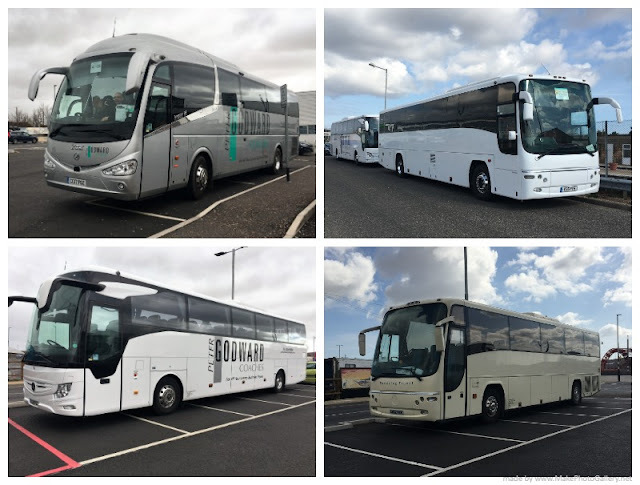 The seventh consecutive day of rail replacement brought the usual operators out to play, although a couple of different coaches made an appearance. Looking in at Lowestoft Railway Station I found Maretts Chariots Volvo M24AAM in the car park on standby with a couple of Angies Coaches available for company. Also in use was Belle Coaches Kassbohrer Setra S315FT-HD 25 LIL9456. I was about to leave and saw Ambassador Travel’s Sunsundegui Sideral bodied Volvo B12M 250 KIG8457 heading back from Beccles along Denmark Road. It later returned to Beccles on the 11:50 departure. Today is the sixth day of rail replacements and the regular suspects were hanging around the Great Yarmouth and Lowestoft Stations as usual. However, this morning Maretts Chariots vehicles were engaged in rail replacement duties at both locations. 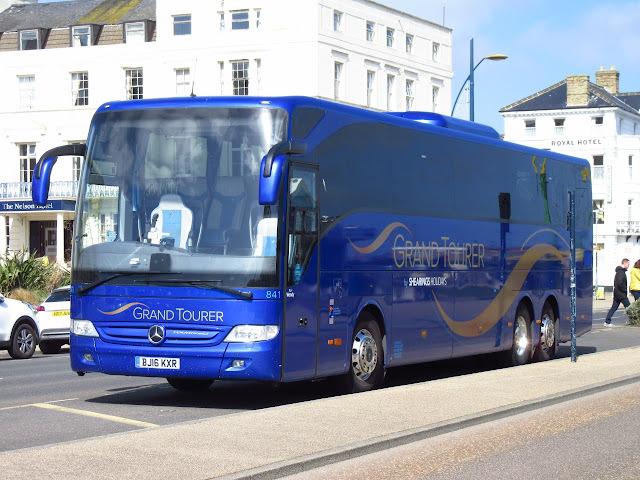 Mercedes Benz Tourismo BG65VXU was waiting time at Great Yarmouth to work the 11:17 to Norwich. It was new in January 2016. 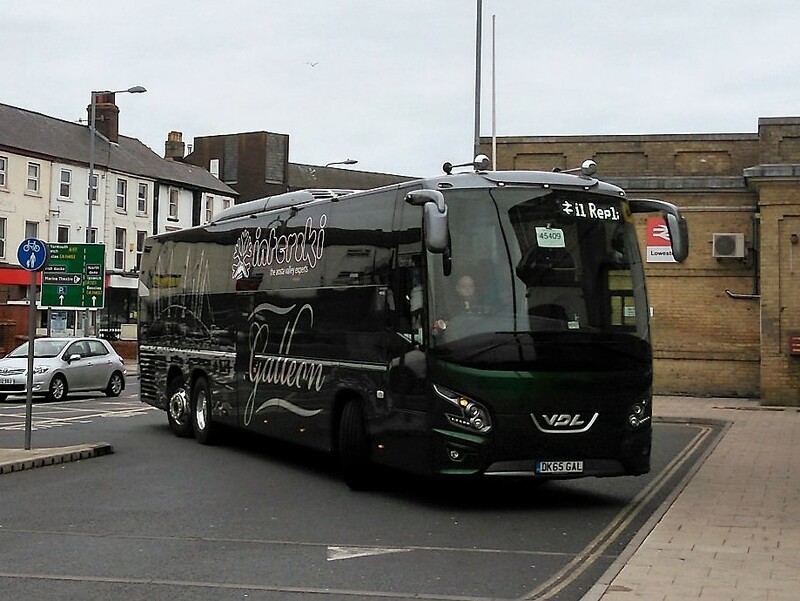 Whilst earlier at Lowestoft, another member of the fleet, Volvo B12BT GDZ435, was getting ready to leave on the 08:57 to Norwich. The coach still retains its previous owner's livery having been purchased from Richards Coaches of Guist. It was new to Whitelaws of Stonehouse in June 2008. Yet another day of rail replacements and at Great Yarmouth Station the same four coaches as yesterday were available for use. They were Peter Godward's CC17PGC and CC18PGC, PTS Group's V25PTS and Tendring Travel's AM52MXW. However, Simon Bartram was on the spot when Belle Coaches supplied their 'Just go! Holidays' liveried Lahden OmniExpress bodied Scania K400EB4 YR61RVO for Rail Replacement use.